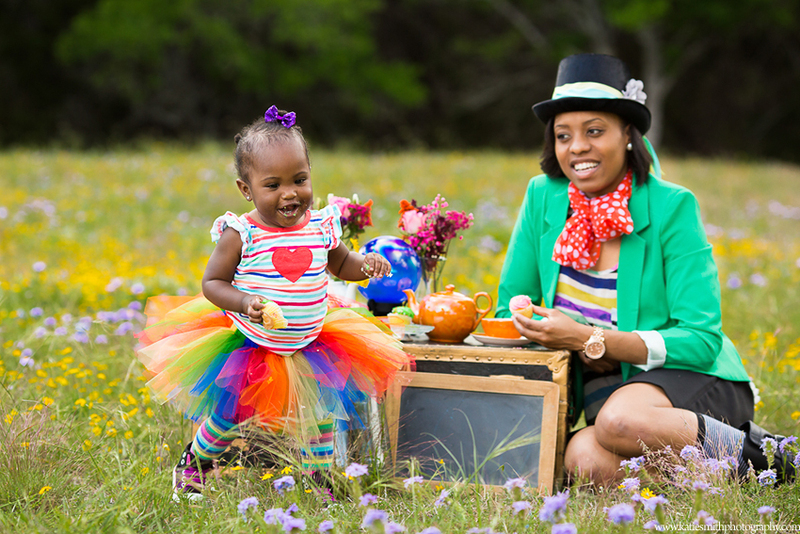 This awesome mom contacted me about a fun tea party photo shoot for her and her daughter. 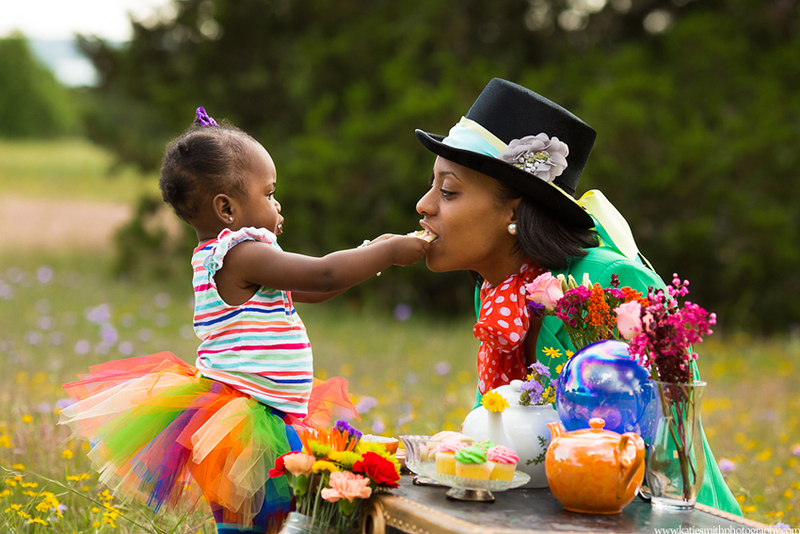 We talked about different styles of tea parties- posh, vintage or Mad Hatter. She chose Mad Hatter and I was so pumped. I love Alice In Wonderland and have habit of singing the White Rabbit’s “I’m Late” song to my kids whenever we’re running behind. 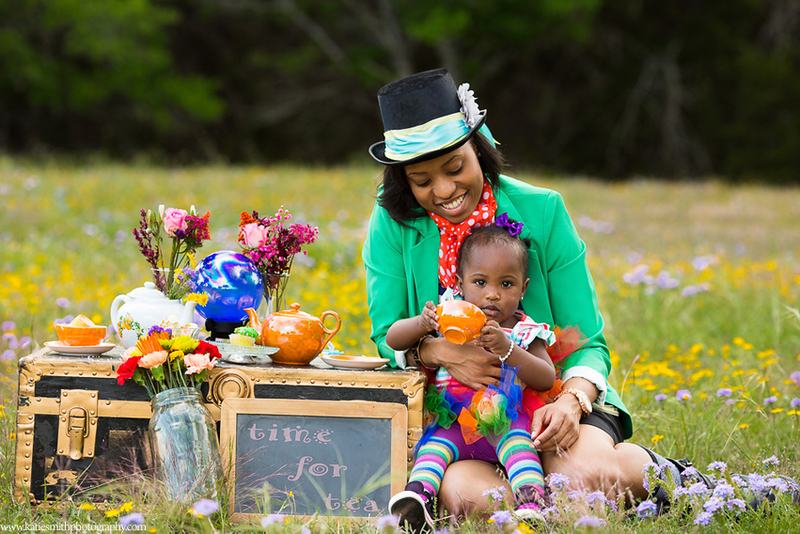 So I started planning and pulling out old props to create a colorful tea party. I found the orange tea set at an antique show. I was given the mushroom by a fellow photographer. Then I picked up a few other things at thrift shops and the grocery store. I was set and so excited to start the session. We talked about what to wear through text and email but I was still in awe of their outfits when I saw them at the photo session. Mom is brilliantly dressed with the cool hat, polka dot scarf, and teal blazer. She’s feminine, sophisticated yet awesomely whimsical. 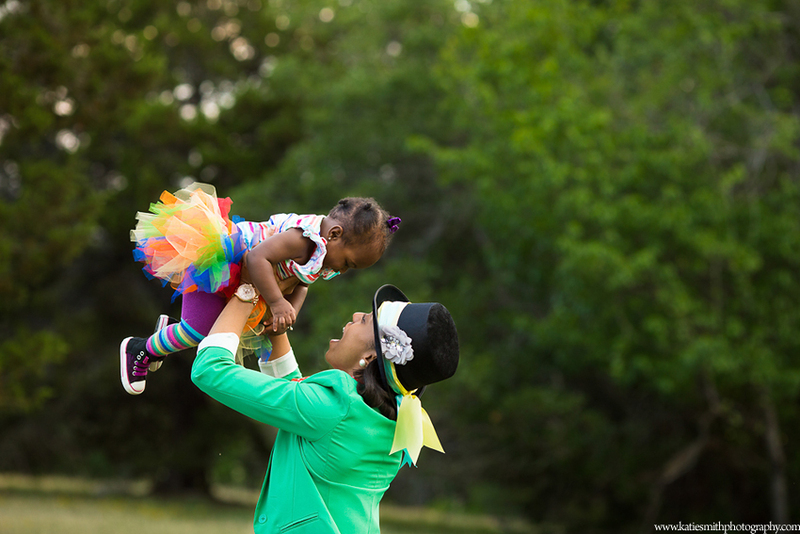 Then the daughter in a rainbow tutu, striped leggings, and high tops. Their outfits made the session. The whole session was so much fun. Little Miss A is a fun and smart little girl. She loved the cookies and cupcakes and spent most of the session with one in each hand. We had pretend tea, picked wildflowers, and played with her friend Geoffrey the Giraffe (see last photo). I loved this session so much and it was only made better by the fact that I got to bring home leftover cupcakes and cookies to nibble on while I edited. 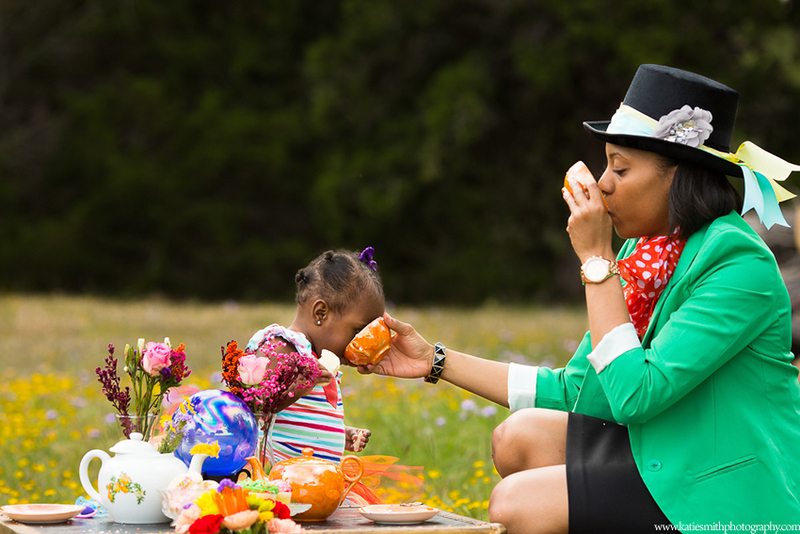 Katie Smith is a child and family photographer located in Central Texas. She loves creating unique, fun sessions that capture her subject’s personality. She likes collecting antique cameras, watching Disney movies, and making up silly songs for her kids. 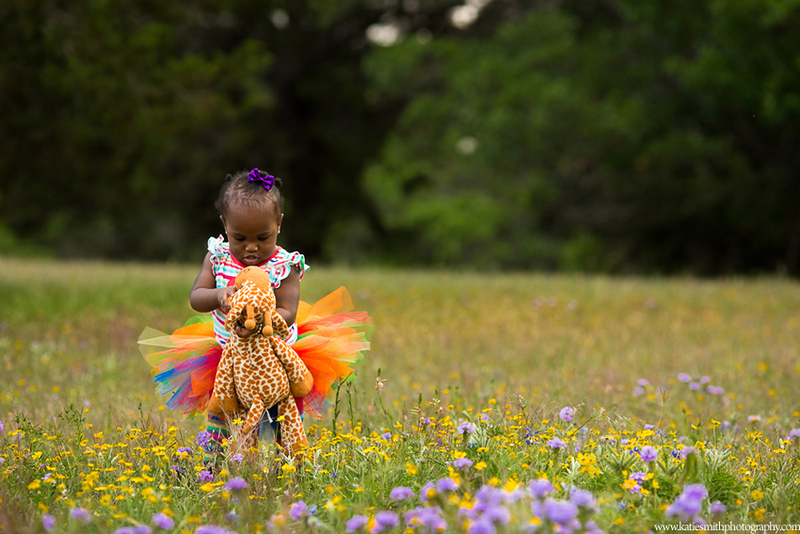 When not photographing Central Texas’ most adorable kids and beautiful parents, she’s usually found at home getting inspired for her next themed shoot. Awwww! This is totally awesome! I love all the colors and how it all came together. 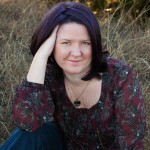 Huge props to mom and you for a fabulous session!